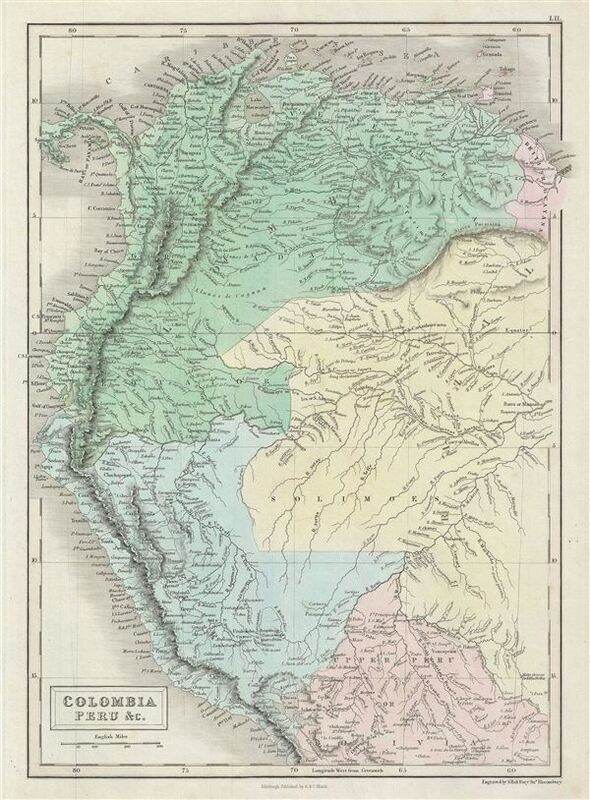 A fine example of Adam and Charles Black's 1851 map of Colombia, Peru, Brazil and British Guyana. The map covers from Panama to Bolivia and east as far as British Guyana. envisioning an independent New World nation comprising all of the territories under the Spanish and Portuguese colonial rule, the Venezuelan revolutionary Francisco de Miranda suggested a consolidated South American empire named after Christopher Columbus. The idea took hold and in 1819 the territories known as the ‘Viceroyalty of New Granada' (comprising of modern day Colombia, ecuador, Panama, and Venezuela), became the first South American region to liberate itself from Spain. The region was renamed ‘Gran Colombia.' The war against Spain ended in the mid-1820s when the pro-Spanish loyalists were decisively crushed. The congress of Cucuta adopted a constitution for the new republic in 1821. The vision of Gran Columbia, unfortunately, proved untenable and both Venezuela and ecuador split off to became independent states 1829 and 1830, respectively. Throughout, the map identifies various cities, towns, rivers, mountain passes and an assortment of additional topographical details. Map is hand colored in pink, green, blue and yellow pastels to define boundaries. The map is engraved by S. Hall and issued as plate no. LII in the 1851 edition of Black's General Atlas. Rumsey 2305.062 (1854 edition). Philips (atlases) 4334.